At our last NBTHK-EB meeting in Nuremberg in March, our topic was utsushi in the widest sense. One of the blade presented was a jûyô-katana by Hankei (繁慶) (picture 1) and in our discussion on how the term “utsushi” can be defined, it was addressed that Hankei had his very own approach to the Sôshû tradition. At his time, we are talking about the Keichô-shintô era, a focus was again on the great Sôshû masters and katana-size Nanbokuchô-style blades was quasi the ultimate goal, i.e. a wide blade with an elongated kissaki and a shallow sori which emulates an ô-suriage tachi of the heyday of the Nanbokuchô era. Hankei, his civilian name was Noda Zenshirô (野田善四郎), originally came from Mikawa province which was also the home province of Tokugawa Ieyasu. It is assumed that he first moved to Sunpu (駿府) to work there as a gunsmith, the profession he had inherited from his father. Ieyasu had established a gunsmith center in Hachiôji (八王子) in Tenshô 18 (天正, 1590) what was Hankei´s second station. There he learned from the gunsmith Agari Sôhachirô (胝惣八郎) who also came from Mikawa and who already worked for Ieyasu at that time. With his studies under Agari, Hankei signed with the name Kiyotaka (清堯). By the way, there are teppô with the mei Kiyotaka extant which bear date signatures from Keichô 15 to 20 (慶長, 1610-1615). Those made exclusively for the Tokugawa family are signed “Nihon Kiyotaka + kaô” (日本清堯) (picture 2) and it is very interesting that there are even swords extant with the very same signature and kaô (although extremely rare) (picture 3). So Hankei shared about the same fate as Kotetsu although forty or so years earlier. Also Kotetsu had his origins in a different but kind of related craft, namely the craft of armor making, and he took changed his profession around the age of 50. However, I assume that Kotetsu had slightly different reasons for becoming a swordsmith. At his time, the demand for newly made armour had drastically dropped. As mentioned in an earlier article, Sekigahara happened 40 years earlier, Ôsaka had fallen more than 30 years ago, and the last great armed conflict – the Shimabara Rebellion from 1637 to 1638 – was at its tenth anniversary. Hankei in turn worked still in a sphere that we define today as Momoyama Culture. In other words, ten or fifteen years after Sekigahara nobody knew that the new bakufu would bring a longstanding peace. And with all the relocations of daimyô and the reorganization of the hierarchic feudal structure, wait and see was the order of the day. That means there was no drastic drop in the demand for firearms that would have forced Kiyotaka/Hankei to look for a new job. But we can agree that both smiths, Kotetsu and Hankei, were highly talented and great personalities as otherwise they would have disappeared from the scene and/or their swords would have been classed into the “also ran” category, i.e. as well-eant swords made by a former armorer or gunsmith respectively. But back to the Momoyama Culture. I have already mentioned that the then fashion in swords inspired Hankei to his style. It is namely very interesting to see that Hankei did not just copy the great Sôshû masters as faithful as possible (of course there are als such works) but took what he understood as Norishige style, who is assumed as being his greatest inspiration, and interpreted this style in a way which can only be described as very strong in character. He made blades with an acute mitsu-mune and a rough itame mixed with masame and hada-ware which appears with plenty of ji-nie and thick chikei as so-called hijiki-hada (鹿尾菜肌・羊栖菜肌・ひじき肌) what has to be undertood as reminiscence of Norishige´s also very peculiar matsukawa-hada. His hamon is usually based on a hiro-suguha or notare, is hardened in nie-deki, and is mixed with gunome-ashi. The nie are thick but not that sparkling. Many sunagashi occur which makes the hamon look partially like as if it is entirely composed of sunagashi. The habuchi is unclear, that means it is often hard on Hankei blades to define an exact line between the ha and the ji. This is for example the case at the ura side´s monouchi of the blade shown in picture 1, and at the kantei at Nuremberg, this area reminded me kind of a sudareba at a glance. 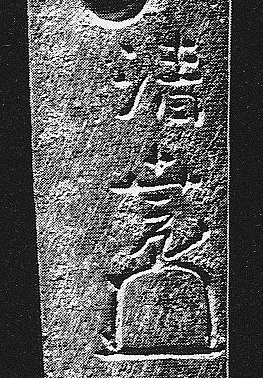 Also very typical for Hankei are his characteristic tang with the deeply notched machi and the so-called yagen-jiri, and the thickly chiselled signature. We don´t know when Hankei died but it is assumed that he lived at least to about mid Kan´ei (1635~40). As for his signature, we distinguish roughly between two categories, namely the so-called ro-mata (ロ又) from the height of his career, the the so-called ru-mata (ル又) signatures from his later years. The names refer to the interpretation of the right part (攵) of the upper radical (敏) which can be chiselled like the katakana syllable ro (ロ) plus the character mata (又) below, or like the katakana syllable ru (ル) plus the character mata below (see picture 5). Now to Hankei´s students and here too, we have some similarities to Kotetsu. Apart from Kotetsu´s adopted son Okimasa (興正) namely, there are only very few works from both schools extant, what concerns for example Kotetsu´s direct students Okihisa (興久) and Okinao (興直), and Hankei´s direct students Hanjô (繁昌) and Masayoshi (正慶). Thus it is assumed that the personality of the great master was so overwhelming that none of the students had the time and chance or was “brave enough” to work on his own and produce fine blades in larger numbers. But also other factors play a role here. As for Hankei, he was a bakufu-employed swordsmith so after his death, there were maybe some reasons for the Tokugawa to not continue the employment with any of the students what meant practically the end for the school. As for Kotetsu, his students were facing different times and so maybe the decreasing demand for swords did not allow them to continue their school into post Jôkyô and Genroku times who knows. In this sense I would like to use the opportunity to introduce some of the rare Hankei-student works and thus the article´s title “Hankei and his school.” First Hanjô (繁昌) as his blades are closest to Hankei. We know that he came originally fromAnzai (安西) in Suruga province and went to Edo where he entered an apprenticeship with Hankei. As I have pointed out that Hankei had returned to Edo after Ieyasu´s death, it is safe to assume that also Hanjô arrived at Edo after the second year of Genna (1616). Interesting is that Hanjô signed his character for “Han” in the ru-mata manner, that means he continued the signature style of the late Hankei and so the theory was forwarded that Hanjô was actually a late signature of Hankei. But this approach is no longer followed as we can see some slight differences in workmanship, for example that Hanjô did not stick so much to Norishige but more on the great early Sôshû masters in general. However, followers of the one person-theory explain this by stating that Hankei maybe moved away from Norishige again towards the end of his career. Also we must bear in mind that in some sources (Tôkô-taikan, p. 512) we read that some of Hanjô´s works are superior to Hankei and that his interpretations are a bit more calm with lesser hada-ware and hijiki-hada, all indicators for the more mature workmanship of an artist. Anyway, the workmanship of Hankei and Hanjô is as mentioned pretty close and I haven´t handled any Hanjô work yet. But what you can learn from oshigata and descriptions is that Hanjô added a pronounced yakikomi at the hamachi. Another Hankei-student we know is Masayoshi (正慶). He is listed as “Masayoshi” but with the Sino-Japanese reading of Hankei´s and Hanjô´s names in mind, his characters might read as “Shôkei.” It is said that Masayoshi came like Hanjô from Anzai in Suruga province. The blade introduced in picture 9 does have plentiful of ji-nie and many thick chikei but the hijiki-hada is not that prominent as at Hankei. The hamon bases on a shallow and early Sôshû-inspired notare and with the sugata and the elongated kissaki, we see again the typical Nanbokuchô or rather Keichô-shintô style. But please note that Masayoshi´s wakizashi comes with an iori-mune instead of a mitsu-mitsu.